Today Ian and I headed out to lunch with some friends. Sitting in the park nibbling, we were able to witness a bus sideswipe an illegally parked car (with the driver still in it). Some "buzzed" (and by buzzed, I mean drunk at 1:30 in the afternoon!) park goers decided to "do good" and run out to yell at the bus driver and "help" the car driver. It was chaos at its finest. The bus was still stuck on the car and trying to move, the "do gooders" were running up and screaming at the bus driver and the lady was sitting in her car. 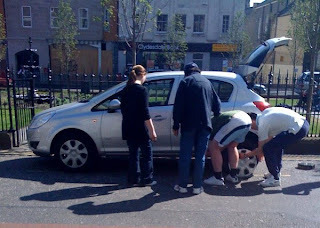 After the bus moved from the side of the car, these "do gooders" took over the ladies car and changed a tire, which popped in the accident, while she was exchanging details with the bus driver. And the "do gooders", being the "great" people that they are, asked for money for their good act by saying, "It's nice to do something nice for someone, but if you've got any money, that would be great." Are you kidding me?!? If I was in that situation, I wouldn't have let those crazy people near my car...they were digging though the whole thing...I am guessing looking to steal stuff. It was a sight to be seen! That is crazy! But it sounds like good entertainment.